We are offering Cheese Winder Machine. We are manufacturing Cheese Winder for Sutli Plant and Woven Sack Tape Plant in different coil size as per customer requirement. Cirwind Machine Mfg.co. Limited offers a wide range of precision and step precision winding machines designed for winding flat or fibrillated PP/HDPE tapes across a multitude of specifications in terms of tape width and denier. 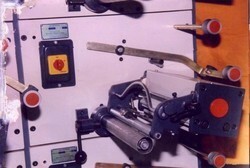 The warp & weft bobbins produced can be used in both circular and flat looms. We, JVM Enterprises are leading manufacturers of Sutli Cheese Winder. Our Cheese winder is with individual torque motor with fine controller belt and other spare. Our Cheese Winder is suitable for 60 mm, 100 mm, and 200 mm coil winding as per customer requirement. We are one of the prominent Cheese Winding Machine Manufacturers and Suppliers in Gujarat. The Cheese Winding Machine, offered by us, is efficient in performance. Therefore, our Cheese Winding Machine is highly demanded amidst the widespread clients. All type of circular loom, cheese winder, power loom spare parts and laber work . We are one of the prominent cheese winding machine manufacturers and suppliers in gujarat. The cheese winding machine, offered by us, is efficient in performance. 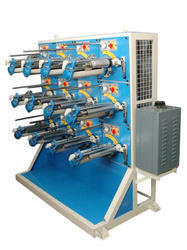 Therefore, our cheese winding machine is highly demanded amidst the widespread clients. This cheese winding machine is available at the market leading prices.